Do you facing the problem when you try to upload large files over slow connection to MOSS 2007? Larger file here is above 10M or bigger...i think we will faced the problem time out is the connection from out side the company. 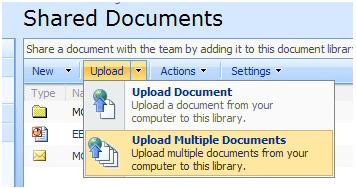 Here have simple way to share that is using multiple upload method to upload. If you want know why this is happen , please go to this blog here is more technical explanation on this. anyway, i still checking on our server why upload the large file to our MOSS server is so slow :(..ha ha..keep on. MOSS and WSS June CU ! !